NewTree’s cozy corner store in downtown SF at 1 Ecker Place, across the alley from Yang Sing’s Stevenson St. location. Is sustainability important to you? 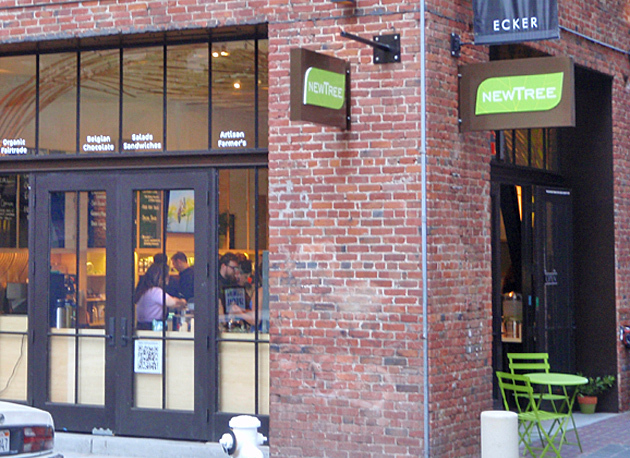 If so, you’ll want to check out NewTree’s flagship café in downtown San Francisco. 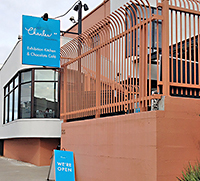 And if sustainability isn’t on your radar yet, you’ll still want to go to enjoy their tasty food, attractive space and healthy take on Belgian chocolate. 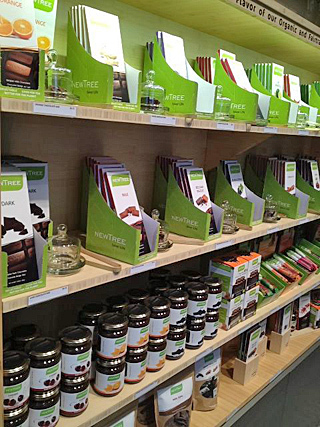 NewTree is a Belgian chocolate maker focused on sustainability that opened a U.S. office in Marin County in 2010. While their chocolate bars can be found from coast to coast in places like Whole Foods, this is their first company-owned café. You can sample bars before you buy at the café. In addition to carrying their full line of bars (and providing samples! ), the café is also where the company’s commitment to sustainability is on public display. According to Udaiyan Jatar (UJ), NewTree’s sustainability and marketing consultant, not only is all the food served at the café locally sourced and organic, but “everything in the café is sustainably focused. There’s recycled paper on the ceiling, recycled pebbles in the floor, recycled crushed glass in the countertop, even Brazilian air plants that just require an occasional misting. NewTree’s approach to sustainability is very holistic. As you might expect with a stated focus on sustainability, their chocolate is all organic and fair trade, their to-go containers are compostable, and their packaging is printed with vegetable inks on recycled paper. In addition to developing strong relationships with their producers, they ship their cacao by boat instead of air. Plus for every bar they sell, they donate 1 euro cent to an indigenous community in the Amazon that is working to preserve the environment and traditional knowledge. 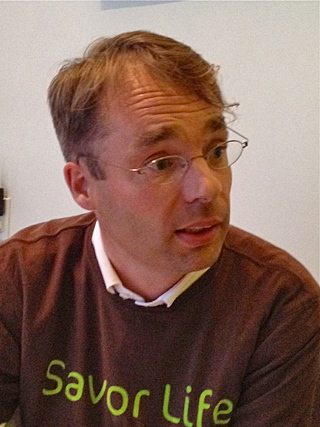 Benoît de Bruyn, NewTree’s CEO & head chocolatier, wearing the company slogan across his heart. The interest in nutrition is another layer of their dedication to sustainability and played into the naming of the company (NewTree/nutrition). They want to sustain the life of the planet, but also the lives of us who live here now. So portion sizes at the café are reasonable — no SuperSizeMe selections here. Sandwiches are on small rolls, hot chocolate is in small cups. But like good chocolate, the fresh organic food satisfies. You don’t need more. Some of us CBTB chocolateers have been sampling the goods, and we all agree: It’s very tasty. Lunch items, like the Belgian salad (shredded Brussels sprouts, Romaine lettuce, radish, feta cheese, cranberries and nuts dressed with pomegranate chocolate vinaigrette dressing) or the Brie and chocolate sandwich on a raisin roll, are a nice change of pace from more typical lunch fare. And the hot chocolate (get there early — it sells out!) is chocolately and thick like European hot chocolate. Desserts, whether they are dense dark chocolate like the Mi-Cuit (molten chocolate cake) or creamy milk chocolate like the lavender mousse, are winners too and not overly sweet. And the bars? We haven’t made it through the whole range (there are around 15 flavors, some milk, some dark), but what we’ve tried have been uniformly good. Lime granola milk chocolate is a nice variation on the more common orange chocolate, and the granola adds an oat-y texture. The cinnamon milk chocolate has a taste that’s reminiscent of chai tea and a small-grit texture, which maybe comes from the cinnamon(?) and is not an unpleasant addition. The quinoa flax bar has a nice balance between the dark chocolate and the crunchy quinoa, a grown-up Nestlé Crunch. 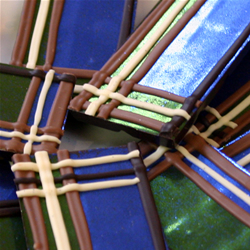 And the Speculoos is a dark chocolate bar full of bits of a traditional European spice cookie. It’s not as crunchy as the quinoa flax bar, and the cookie adds a caramelized taste to the chocolate. Other flavors I look forward to tasting are Thyme, Ginger and Superfruit (cranberries, pomegranate and papaya). One of the nice things about the café is that they carry the full line of NewTree products, some of which are new since May and some created expressly for the U.S. market. It’s conveniently located a couple of blocks from the Montgomery BART station, so it will be easy to check out what’s new and stock up whenever you’re downtown. Not surprisingly, he is in talks with other chocolate manufacturers who are interested in using his process to make their spreads healthier too. NewTree seems to be a culmination of Benuît’s diverse interests: science, food, sustainability, nutrition and nature. Starting from a childhood interest in birds and bats, he became an expert on Belgian bats (“Bats are very intelligent animals that use the highest technology to locate themselves”). Adding an interest in science to his interest in nature got him into engineering. And interests in chocolate and social justice lead him to create the healthy, sustainable and tasty NewTree line. Date posted: June 12, 2012. This entry was posted in Listed chocolate maker, Review, San Francisco chocolate, Vitamin Ch and tagged Belgian chocolate, Benoît de Bruyn, cafe, chocolate cafe, fair trade, green, NewTree, organic, sustainable, Whole Foods. Bookmark the permalink. I visited New Tree on my last trip to San Fransisco. What a find! Almost entirely guilt free chocolate, and the salad with the chocolate balsamic and pomegranate dressing was, quite frankly, the best I have ever tasted . I should never have imagined that shredded brussel sprouts would be so entirely delicious. I had a mocha to drink and of course a small chocolate bar which was just enough decadence for lunch.